Avencore 50m Roll Super High-End 99.9% Oxygen Free 12 AWG 2-Core Speaker Cable + FREE SHIPPING! Master Chefs the world over agree that one ingredient above all others is absolutely necessary, regardless of the dish: copper. No, not in the recipe, but in the cookware! And the same conductive properties that spread heat across pots and pans are fully utilised in this 50m Roll of Super High-End 99.9% Oxygen Free 12 AWG Speaker Cable to deliver low-resistance throughout; from your amplifier to your medium to high-end speakers! That's pretty much all there is to it! With 50 metres, you'll never run a few agonizing centimetres short due to a bad measurement, and you'll be able to lay extended cable runs between rooms or across even the largest home theatre. And at a hefty 12 AWG, you know it can cope with all but the most extreme sound systems, making it the perfect compromise between price and performance for the at-home enthusiast! Just to let you know that I am more than happy with this product. I spent a fair while researching a number of different sites looking for high quality speaker cable that didn't cost a fortune. None of them came close to the comprehensive range, quality and competitive prices offered by Cable Chick or could compete on delivery costs. Similar speaker cable on other sites I visited cost over twice as much in a number of cases and to cap things off my order was upgraded to overnight delivery at no extra charge. I have no hesitation in recommending Cable Chick, both for the range of products offered and the excellent pricing backed up by first class service. really nice. Thanks to Cable Chick, they brought something previously cost-prohibitive to within my reach. 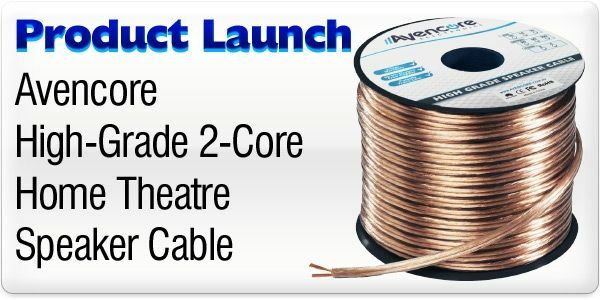 Trust premium quality Avencore cabling to deliver the best possible signal to all your home theatre components. Avencore's high-grade 12AWG speaker cable has the bulk to work with powerful speaker systems over longer distances compared to thinner options. I have only been a customer of yours for a short time but I have enjoyed the fast friendly service and will continue to use your products.